Thursday mass preparations to honor Kenneth Matiba in top gear at Ihura Stadium – Kenyatta University TV (KUTV). All Rights Reserved. 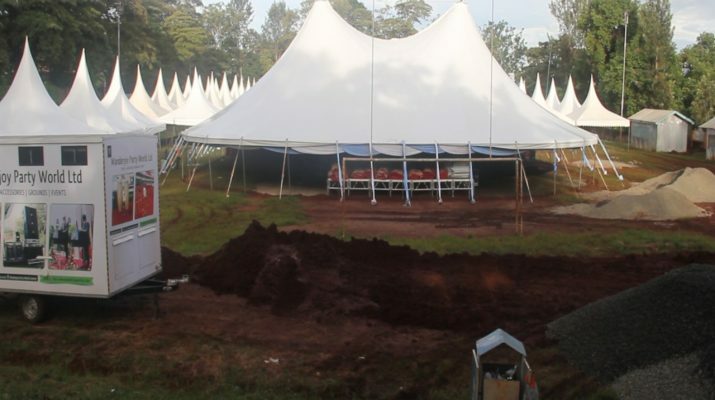 Preparations for a requiem mass that will be held on Thursday at Ihura Stadium in Murang’a County to honor Kenneth Matiba are in top gear with all workers and stakeholders putting their best food forward to complete the works in time. Despite the cold and rainy weather conditions that is being experienced in the County, most of the work has been done. Kiharu Legislator Ndindi Nyoro, speaking on the ground where the preparation activities were ongoing said that the progress is impressive and called upon all residents from Murang’a and the nation at large to attend in big numbers as there is enough space to accommodate everyone. As a way of remembering the great hero,Ndindi requested the National Government to consider tarmacking one of the roads that leads to his Kiharu home in Wangu Ward and name it after him for posterity and that a vocation training college that will be put up in Kiharu by the CDF in conjunction with the ministry of education be named after Matiba. On the same note Ndindi said that he had petitioned the National Assembly and the Attorney General that the high court speed up paying Matiba’s family all damages that were awarded by the court as a way of giving the family some relief for what Matiba went through. Speaking during the preparations Murang’a County Commissioner John Elung’ata said that security within Ihura stadium and around town will be tight with over 500 police officers in uniform being deployed. A police post will be set up just near the stadium where one can report any incident and called upon all Kenyans to come out in large numbers as the President and his Deputy are expected in the mass where they will have brief stop overs to wave to crowds along Murang’a Kenol road .He called upon motorists to use the guidelines that have been put where travel routes have been put in place and several parking in the outskirts of town. He added that just few vehicles especially for the VIPs and family members will be parked within the ground.